Our campsite complete with tent, whirligig, clothesline, chairs, tripod grill and wonder of wonders a picnic table and electric outlet. The sidewalk curving in front is part of a walking trail. It was exhausting just watching all of the people determined to exercise. 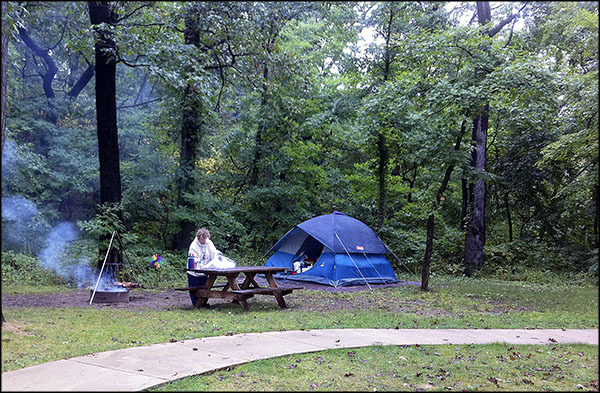 Camping is exercise; jogging on your vacation is masochism. 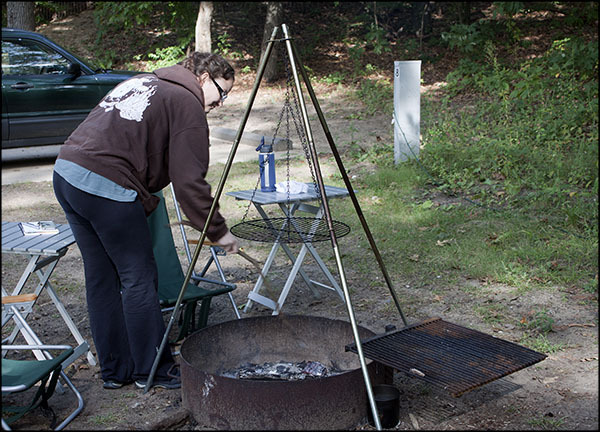 Kristin and I have always subscribed to the philosophy that if you are going camping, you should sleep in a tent and cook over a fire. That said those things are a lot better to do in the sunshine rather than in the rain. 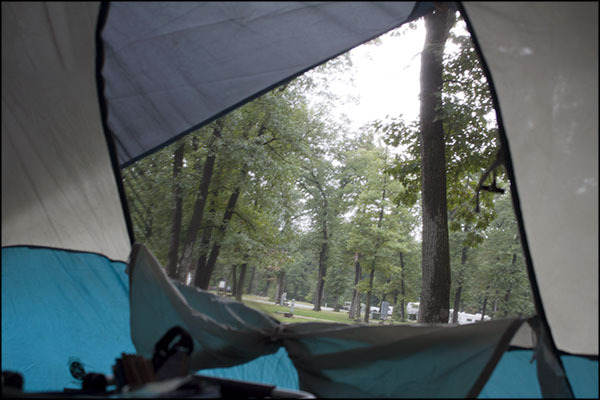 Sunday night when we were able to check into our campsite at the Indiana Dunes State Park, it began to rain, hard. 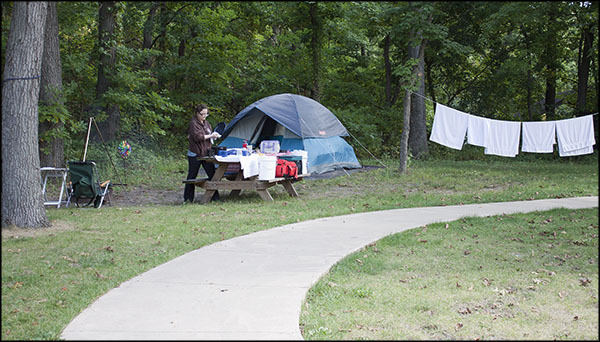 We are veteran campers and had the tent up in ten minutes and everything else in camp-shape in less than an hour. We got wet, but being wet is not the most terrible thing that can happen to us because our extra clothes and sleeping gear are in waterproof bags and our tent is relatively leak proof. What it is not is mud proof. Trying to keep everything away from the central muddy walkway is a thankless task and continues until the sun comes out. It's raining and looks like it will continue. I took this photo after we were unpacked and tucked away. 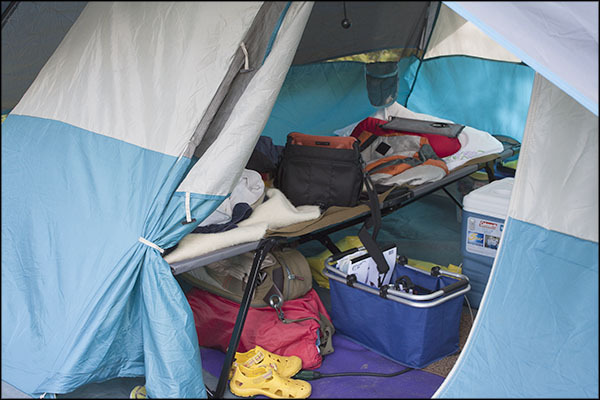 It is raining and you can see that some of the campers had more deluxe accommodations. Kristin and I both think recreational vehicles are cheating when you want to go into the great outdoors, but if anyone wants to exchange our tent for one of those I don’t think we would turn you down. 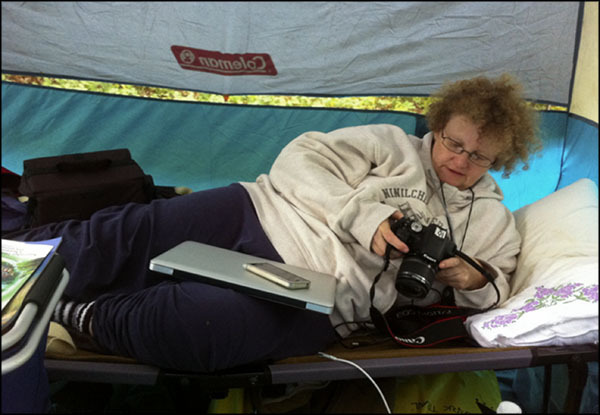 What do you do in a tent when it rains? Play with your phone. We love our electronics. Kristin is reading a novel. Because the phone has its own light, you don’t have to hold a battery operated lantern 2 inches from a page to read. Light is something that we don’t think about much anymore since the invention of the lightbulb. Not much can be done without the sun if you do not have electric light. You can adjust lanterns all you want, but in the end you just end up going to sleep when the sun sets and getting up when the sun rises. All of those electronics and where do I start? An electric hookup allowed us to take the electronics. We didn’t have wifi, but we took a lot of pictures and having a computer to empty the camera card onto let us shoot as many photos and videos as we wanted. We knew the nights would be cold and were prepared, but posting to facebook had to be fast. Staying warm was only possible if your were completely zipped up and mummified. 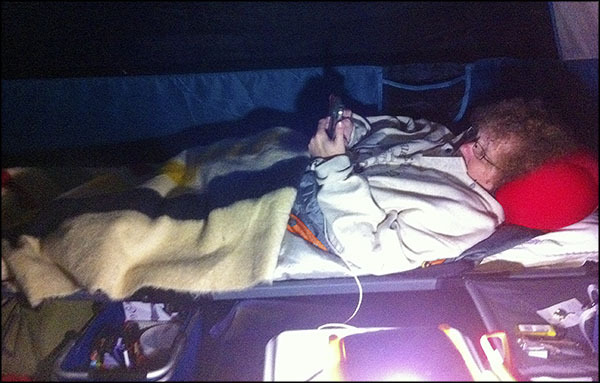 The following photos are of the inside of the tent. It seems to be getting smaller and smaller, but I suppose that’s because we are getting more and more camping “bling.” With the cots we added this year, the slope of the tent became a problem. 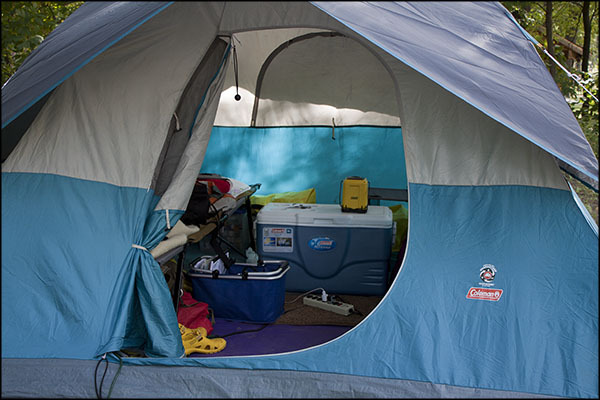 It’s not that hitting the ceiling will hurt your head, but that if it is raining touching the tent wall can start a leak that cannot be stopped. We use the coolers for side tables and stuff all the rest of the gear under our cots. We have found all sorts of uses for the dense foam that is a yoga mat. When it is raining, throwing them on top of the tent provides extra protection from leaks and after the rain they can cover the mud in the walkway. Coolers as side tables and gear waiting to be shoved back under the cot. Kristin's side of the tent. 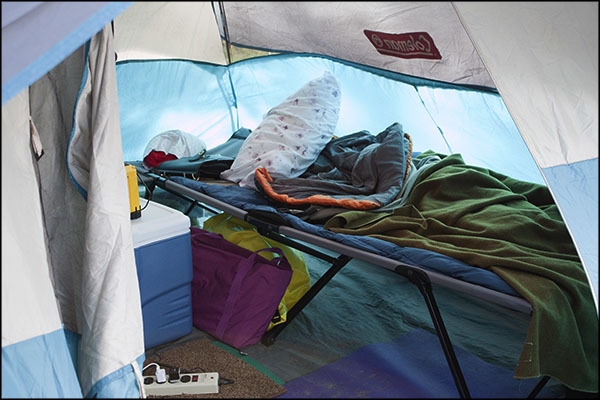 Notice the blanket under the two sleeping bags and the wool blanket on top. We were able to take real pillows this year. There is more room for fluffy luxuries in a Subaru than in a rubber raft. My side of the tent. It may be a tad messier than Kristin's side. The next photo shows Kristin poking at the ashes of our previous fire to see if there are any coals hot enough to get the fire going again or if we have to start from scratch. We ran out of fire-starter quick because of the damp weather and the camp store did not have any in stock. We have carried tealight candles with us for a long time, because I had read somewhere that they were useful in starting campfires. I never used them because the fire-starter did the job. It turns out that tealights work better, because they stay lit longer and can set even the wettest wood aflame. Campsite fire. Usually when we camp on the river, we forage for our own firewood. We had to buy wood at the campground store and the wood was not much more than kindling which burned quickly. Just enough to prepare a meal, but not enough for warmth. Kristin is doing the dishes. Our one enamel cooking pot serves as our dishwashing basin. 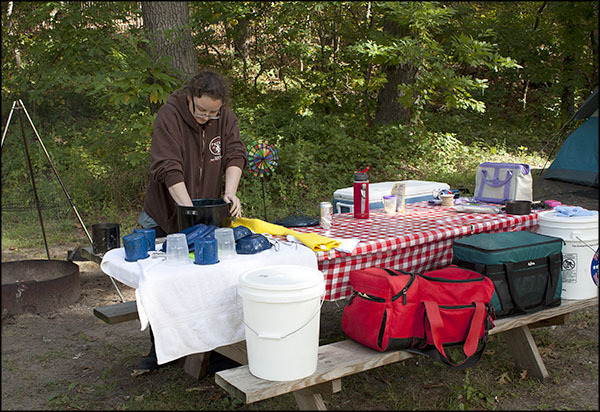 We did not have to conserve water as much in the campground as on the river, but this way the pot gets cleaned the same time as the other dishes. A good thing, since we would rather be doing other things than washing pots. A woman's work is never done. 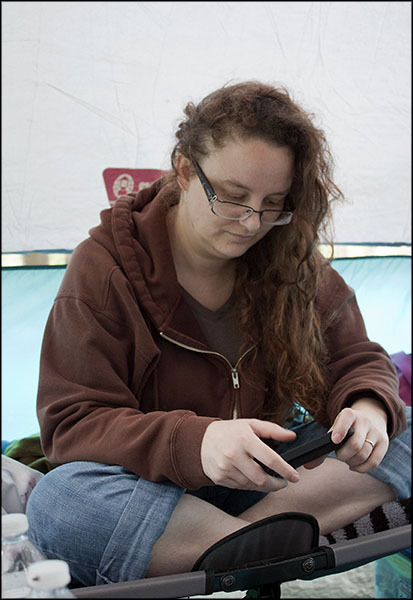 This is one reason I generally refuse to camp with men. They wander off and go fishing when cooking and washing dishes are mentioned. When it's just us women we trade chores. I'll cook, if you wash. Or I'll get water, if you put things away. My pants are rolled to my knees because of all the mud. If the cuffs get wet, it could take all day for them to dry. We use a tripod when cooking. It holds our cooking pot and sausages can be set around it at the same time. Plus, it is really cool to raise and lower the grill to control the temperature of the cooking process. I am setting up the grill and tripod for breakfast. When it's cold, oatmeal mixed with dried milk tastes wonderful. A handful of dried blueberries and brown sugar makes it a feast. It’s early in the morning and the fire has just been started. I’m carrying things from the tent to the table so we can begin to prepare breakfast. 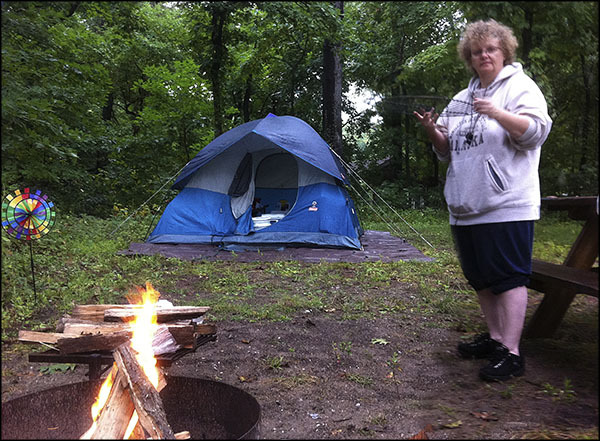 Even with rain, extreme heat or extra cold, camping is something Kristin and I will always love. Your life is reduced to sleeping and eating and doing what you wish during the long, lovely hours between.